Customs fraud and negligence penalties under 19 USC 1592 are an enforcement tool used by U.S. Customs & Border Protection (“Customs”) to make sure laws concerning HTSUS tariff classification, valuation, and others, are followed when importing into the United States. An importer who violates 19 USC 1592 will face serious consequences for his business, and might possibly face personal liability. What is 19 USC 1592? In essence, 19 USC 1592 is a law that penalizes any person that does or attempts to enter or introduce merchandise into the United States by means of any 1) material omission or 2) material and false document, written or oral statement, or act that has the potential to alter the classification, appraisement, or admissibility of merchandise. § 1592(a)(1)(A). It is also a violation to aid or abet anyone in violating this law. § 1592(a)(1)(B) This law is violated even if the government does not lose duties or other revenue. What’s the difference between fraud, negligence and gross negligence under 19 USC 1592? We’ve written about how the amount of a 1592 penalty is calculated before. How is 1592 penalty issued by CBP? violator can be any person or people involved, including the importer of record, an employee, agent, consignee, etc. You are not immune just because a corporation, limited liability company, or someone else is the importer of record; that’s right, there is personal liability for 1592 penalties. Before Customs issues the 1592 penalty, however, CBP must first issue a pre-penalty notice that typically gives the person 30 days to respond and provide reasons why they should not be penalized. § 1592(b)(1). Although somewhat rare, Customs can then decide against penalty; however, in most circumstances Customs goes forward and issues a 1592 penalty notice. Even if your company receives a pre-penalty notice Customs may still, in the future, go after individuals without issuing another pre-penalty notice to them. Ignoring a 1592 penalty notice just because it is against a corporation or LLC should never be done. Again, there is personal liability for 1592 penalties. 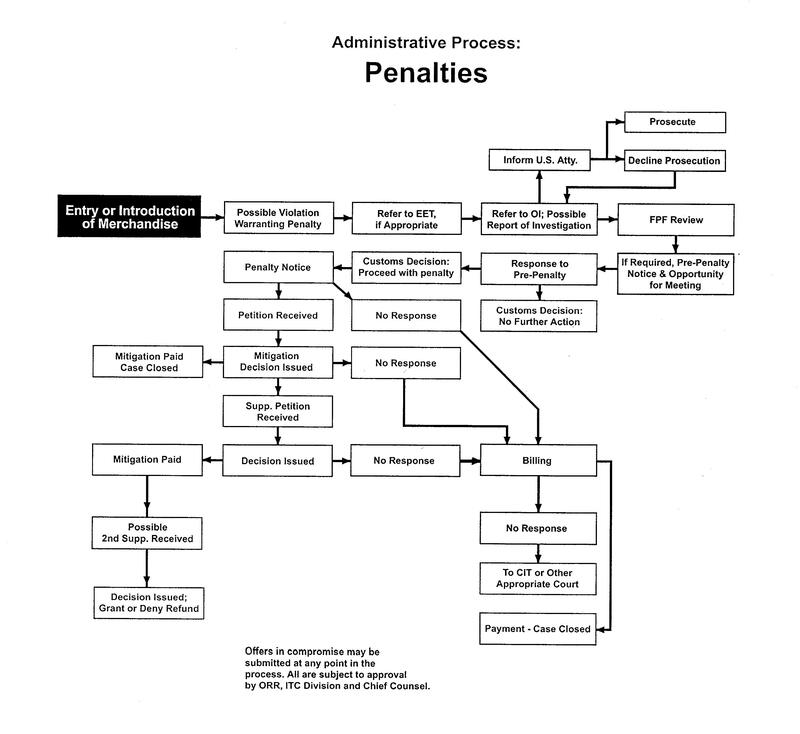 I received a 1592 penalty notice or pre-penalty notice, now what? If you or your company received 1592 penalty notice or pre-penalty notice it should be taken very seriously. Typically, a penalty notice requires a response within 60 days by either paying the alleged penalty, or as we typically recommend to clients, by making an offer in compromise or filing a petition for remission and/or mitigation. These responses should be drafted by a customs lawyer, and should argue, where the facts and law allow, against imposition of a 1592 penalty or reduction in the level of culpability, along with a request to make an oral presentation to Customs. The petition usually will involves an analysis of the underlying allegations, such as valuation or classification. After Customs first decision on any petition, there is an additional opportunity to file a second or supplemental petitions to argue for a more favorable decision. If you are faced with a penalty, or have recently discovered violations of 19 USC 592 and are considering a prior disclosure to avoid harsh penalties then please contact our office immediately by filling out our contact form or by calling (734) 855-499 and speaking with a customs lawyer directly.